To be an informed, confident and effective teacher who responds to the needs of your learners, you need to know your subject. Many native English speakers think there are three tenses of English (past, present and future, right?). There are actually thirteen! If you were in any doubt, take a look at this amazing Grammar Guide from the TEFL Express experts. Grammar is an area many teachers feel less than prepared to teach and this easy-access 42-page guide will be your companion both in the classroom and as you prepare your lessons. The TEFL Express Grammar Guide will take you through the basics of English grammar at Elementary and Pre-intermediate levels. This will give you the expert knowledge you need to be able to teach the essentials of English grammar confidently. The guide is divided into eight clearly-labelled sections. For each grammar point there are concise explanations of ‘how we make it’and ‘how we use it’. The guide is illustrated, making grammar distinctions easier to understand. There are tables and charts showing you clearly how the grammar works in a way that will allow you to explain it clearly. There are also exercises for you to practise as you progress on the path to becoming a confident teacher who can be of use to students when they need your expertise. There is also a section that shows the most common mistakes learners make with each grammar point. This will help you prepare for difficult questions that may come up. You will be able to predict where your students are most likely to have trouble and thereby allocate time to those potential hazards. There are also some extra points you should watch out for. This well-written and beautifully laid out guide will be a valuable addition to any teacher’s toolkit and you will come back to it again and again as you develop into a confident and able English language teacher. One thing is for sure; your students will expect it of you. 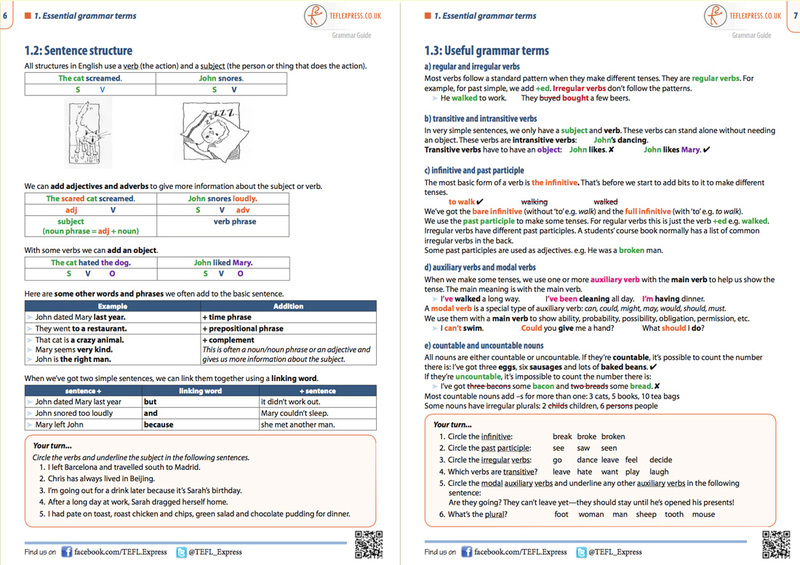 What’s really clever about the Grammar Guide is you don-t need to pack suitcases of books -this 42-page guide is downloadable instantly! TEFL Express Grammar Guide is really easy to download wherever you are in the world. Put it together with the TEFL Express Lesson Plan Compendium and Ready-to-Roll! 30 Preparation-Free Activities and you will be well-equipped to start teaching tomorrow.